BOH Student Jovita Setiono and clinical specialist representative Katrina Di Mauro. 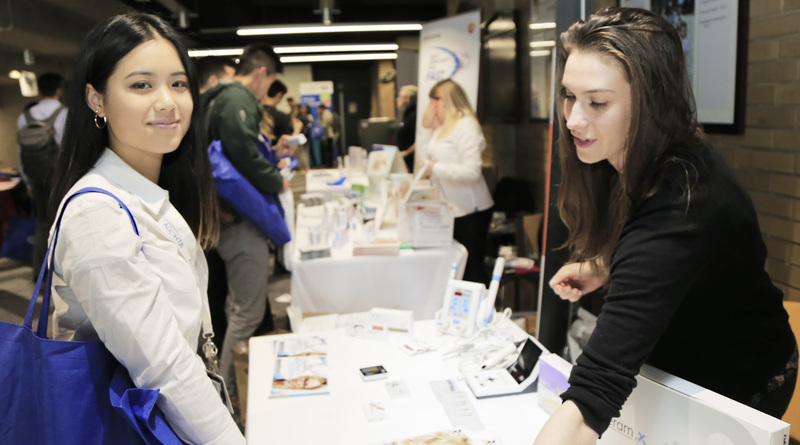 Around 500 delegates have attended the Sydney Dental School’s annual research day at Westmead Hospital. Academic staff, researchers and 400 dental students took part in the exchange of ideas about the latest in dental and oral medicine research. The Sydney Dental School has been training dental practitioners for more than a century, with a focus on innovation and research, particularly in the areas of ageing and chronic disease. Based at the University of Sydney, the dental school works closely with the Westmead Centre for Oral Health, a leading oral health teaching hospital. The delegates engage in many different areas of medical research, primarily focused on oral and dental health, with the goal of making breakthroughs in treatments and the understanding of disease. Associate Professor Ky-Anh Nguyen, a leading scientist, academic and clinician at the Sydney Dental School, is a faculty member at the Westmead Millennium Institute for Medical Research. The research day is a way of immersing staff and students in the latest dialogues. Dental students Pete Upatising and Ya-Jin Hah. “We try to encourage research activity in our school overall, so we have every single tier of student all the way up to staff actually doing some research and this is their option to present some research,” Dr Nguyen said. Dr Nguyen’s own research focuses on using molecular studies to understand how certain oral bacteria cause gum disease and systemic diseases. The day is structured with an opportunity for attendees to present their work and findings. “And I think it’s important for the students to be exposed to the research our academics are doing and also for the academics to get to know what the students are doing in the research part, because there are so many different projects out there,” Dr Nguyen said. Research is conducted at the Institute for Dental Research, the oldest research institute in Australia, at Westmead Hospital and the Sydney Dental School. Other institutions represented at the gathering included the Sydney Dental Hospital and the Westmead Centre for Oral Health. A lecture at the Westmead Sydney University Dental Students Research day. Manager of Education and Research at the Sydney Dental School, Tracey McClure, said the school was based on four locations, making gatherings like the one at Westmead an important networking opportunity for faculty members and students. “It’s the one date on the calendar every year that our whole school gets together and they’re all in the one place,” she said. Ms McClure said the school was in the process of consolidating at Westmead. “So it’s not only good for collaboration but it’s good just to see the diversity of research that we do in the dental school, and it’s an opportunity to speak with your colleagues,” she said. Third year student Ned Rohrt, from the University of Sydney, was one of the hundreds of undergraduate and post-graduate students in attendance. “It’s definitely beneficial, particularly as you are getting to the end of your degree when your knowledge is a lot broader,” he said.